How is solid manure applied to cropland? 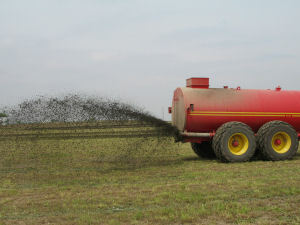 The most common equipment for applying solids to the land is a rear-discharge, box-type spreader equipped with beaters that broadcast the manure over a width of several feet (see Image 1). Usually, the manure is conveyed to the beaters at the rear by slats attached at each end to a sprocket-driven chain. Some use a powered front end-gate to push the material to the beaters at the rear. To handle semisolid manure, a tight-fitting, closable rear end-gate is required. Some spreaders have a side discharge; most of these have V-shaped hoppers and feed the material to the discharge with augers. A rotating expeller slings the material out of the discharge port. The application rate is varied by an adjustable gate opening, usually operated by a hydraulic cylinder. Flail-type spreaders have a semicircular hopper bottom and a rotating shaft with chain-suspended hammers to fling the material from the hopper. The flail-type and the side-discharge spreaders are adapted to both semisolid and solid manure. Image 1: Broadcasting manure on cropland. 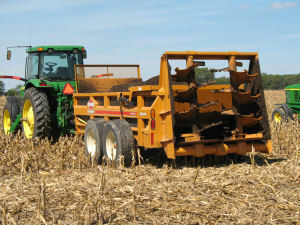 Manure spreaders may be tractor-drawn models or they may be mounted on a truck. Most tractor-drawn spreaders are PTO operated, but some are driven from the ground wheels. Some are hydraulically powered for greater speed variation, especially for the apron drive, to vary the application rate. In the past, spreader capacities varied from about 30 to 400 cubic feet with tractor horsepower requirements ranging from 10 to more than 120. Authors: Jon Rausch, Ohio State University and Ted Tyson, Auburn University.